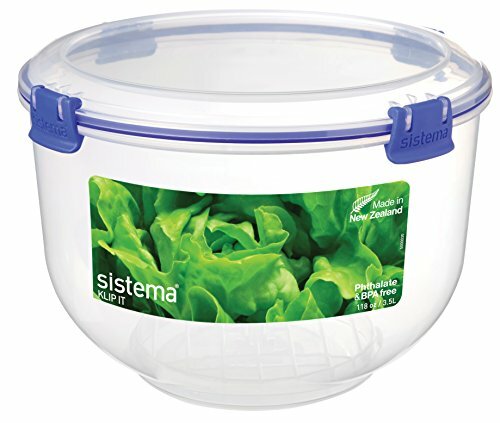 Affordable top-rated lettuce containers from name brands such as Rubbermaid, Progressive and Tupperware. Always have fresh, crispy lettuce and leafy-green vegetables on hand. Lettuce containers are important kitchen storage solutions. We have a no-throw out food policy in our home. That means if we buy the food, we eat it. So I carefully plan menus and snacks, so that the food is in the house to easily and quickly make a planned meal. Both my husband and I love crisp salads and the way that chopped lettuce goes with beef and olives in tacos and dishes like that. So every week I buy 3 or 4 heads of lettuce - and then the game is on to make sure they last the whole week. 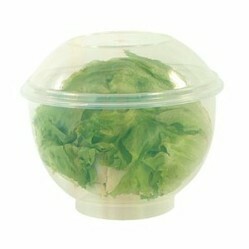 There are lettuce containers that will store the entire head of lettuce. That's great for the greens at the end of the week. However, I usually have to use a salad spinner to wash and dry a few heads and then store them in other containers. I have found that we eat more salads when all the vegetables are ready to go. When we are tired after a long day at work, neither of us wants to wash, dry and chop all of the vegetables that go into the salad. So after we go grocery shopping. I pour a beer, put on some chopping music and get to work. It only takes about 90 minutes to prepare the salad vegetables for the week and is well worth the effort. 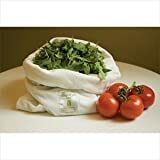 The Progressive International Lettuce Keeper is the easiest way I know to effectively save your lettuce from wilting as soon as you open the lettuce bag. All you have to do is when you get home from shopping take your lettuce out of the shopping bag, throw it in the Lettuce Keeper and rinse it, cover it and put it in the refrigerator. The Progressive Lettuce Keeper is designed to double as a colander. The water in the base keeps your lettuce and other leafy greens moist. There's also a vent to encourage air ciruclation. The convenient oblong shape works in my refrigerator most of the time. It measures a generous 12.5 inches x 7.5 inches x 6.2 inches. So it holds a lot of lettuce. There's a divider if you need to store more than one type of produce. It also works well for non-head lettuce like Romaine. 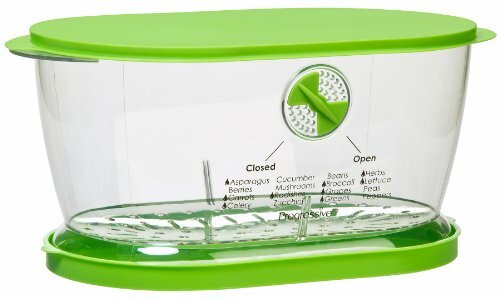 I admit if I have time, I use my Salad Spinner to get the lettuce really clean and dry and then I put it in my Progressive Lettuce Container. But if you are really busy, using the colander is a great option! The Klip It Lettuce Keeper only works for head lettuce because you have to core the lettuce head and then place it on the spike which is attachet to the bottom. You then securely attach the top. I like to use this Lettuce Keeper for Boston Lettuce. It keeps any odor or smells away from the lettuce. It lasts the entire week as well. However, some times the round shape is hard to fit into the refrigerator. Measures 8.7 inches across and 6.9 inches high. 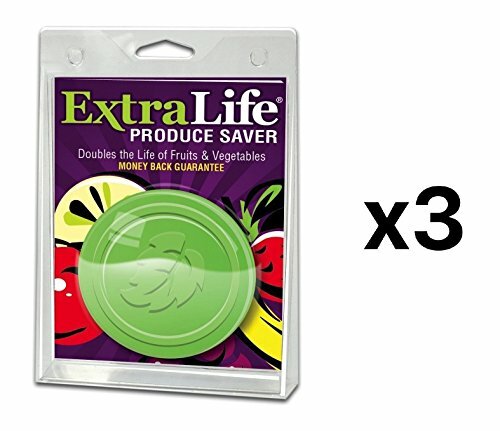 If you don't have the space in your refrigerator for lots of containers or don't have the time to fuss with them, then the Extra Life Produce Preserver Disks might be the perfect solution for you. All you have to do is place the disk in your produce bin after you taken off the gold seal, which activates the ExtraLife Produce disk. There's a breathable pouch inside the disk that holds the active ingredient that keeps your lettuce and other vegetables fresher longer. We Love Our Salad in a Taco! Cost-saving spice racks for your kitchen and cooking. Hearty Italian panini sandwiches, made with a panini grill maker, blend the flavors of meat, cheeses, vegetables and even fruit to perfection.